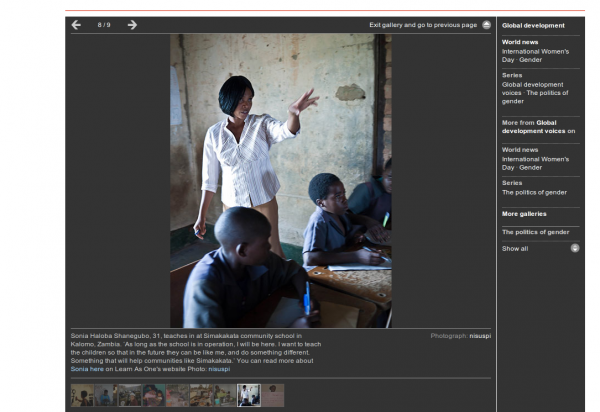 Very happy to see a picture of mine has been chosen by the Guardian for International Women’s Day. I’ve written about Sonia many times in the past – she’s one of the most inspirational people I know. Bright, intelligent and with enough family problems that she could and probably should be doing anything she wanted in one of Zambia’s major cities. Instead she chooses to stay in a poor, remote school and walk 14km a day to try and make the world a slightly better place. Sonia’s story – as it was two years’ ago – is over here. I cry every time I read it back. No matter how little she has or earns, she always puts other people first. And her partner, who scrimped and saved to help her go to college, is the same. And there’s no reward for what she does. No karmic payback. Last year, she lost her third child – a baby, under a year old – to measles. A stupid, treatable, eradicable disease that picks on the best and the worst of us indiscriminately. Last time I spoke to Sonia, she was praying for the chance to go back to college to get the next level of teaching qualifications she needs to continue improving her own career and maybe, one day, start her own school. I can only wish her the best of luck.